On Monday the 12th of September 2011 I attended a meeting of Cambridgeshire Police Authority’s Scrutiny Committee at which I used the public speaking slot to raise some concerns about the police force’s implementation of restorative justice disposals. Restorative justice disposals as used by Cambridgeshire Police involve a PCSO or constable issuing an offender with a punishment, or requiring they make some sort of reparation for their crime, in agreement with the victim. Cambridgeshire is aiming for such disposals to take place within an hour. This route is an alternative to a fixed penalty notice or going through the time consuming and expensive traditional process of arrest followed by a caution or an appearance in court. Cambridgeshire police have agreed to meet all my requests for increased transparency in relation to their processes for using restorative justice. This is fantastic. It should provide a good basis from which to continue considering what the force is doing. The force stated that their policy framework for restorative justice was non-prescriptive and the list of offences is non-binding and that any offence could potentially be considered for a restorative justice disposal. This position does rather detract from the value of getting them to release the policy framework in the first place and makes me worry that appropriate limits and caps on the use of restorative justice are not in place. Proposals to use restorative justice have to be approved at least by a PCSO or constable’s sergeant; more unusual proposals, for example in relation to more serious offences or those not listed in the framework, will require the approval of more senior officers. There is at least some degree of oversight there and we don’t have individuals acting alone. No offender can have more than one opportunity for a restorative justice disposal within Cambridgeshire. (However it appears that one disposal may cover multiple offences, and one individual can go through restorative justice with multiple forces). I had written to the authority to notify them of my statement. When I arrived at the meeting I was told what I had written had been distributed to committee members and I was given a strictly timed three minutes at the meeting to highlight the key points I wanted to raise. I explained I was concerned about the information available about the way Cambridgeshire Police were operating their restorative justice practices. I told the committee I’d tried to obtain the force’s framework document via FOI but what I’d been sent was clearly incomplete as it omitted any mention of the “gravity score” system mentioned in the paper before the committee. The score would be used for determining the seriousness of an offence and if it was suitable for a restorative justice disposal . I suggested that as well as the list of offences restorative justice was permitted to be used in relation to, more information about how the force was using it ought be made easily available such as that relating to record keeping (eg. if courts will be told of a person’s history of being dealt with via restorative justice) and what safeguards and limits there were to the type of punishments which could be imposed and if an individual officer acting alone would be able to hand them out. I pointed out the force’s website was out of date, and had not been updated to reflect the massive increase in the number of offences which since June 2011 the force now considers potentially appropriate for a restorative justice disposal. I noted that the full police authority had only been told of the broadening of the range of offences to be only via an oral update, without any details in writing. I explained how I thought the police authority ought to have taken more of a leading role in considering, and approving, or not, this significant, strategic, change to the way Cambridgeshire is policed; and it shouldn’t have been something left for senior police officers to devise in secret. I explained my impression that the police were trying to give the impression that restorative justice was to be used for only very minor offences (I cited the Cambridge News article about it being used for someone urinating on the street) , but suggested that was not consistent with their wish to reduce the number they take into custody by a quarter or the range of offences they were now proposing applying the process to. Lastly I pointed out that the research cited in the report to the committee (or documents referred to in the report) showed restorative justice could be effective if used after someone was sentenced, as part of their rehabilitation, and that the use by Cambridgeshire Police, for disposals on the street, within the hour was quite different, so different that evidence one works shouldn’t be used to justify doing the other, and if Cambridgeshire Police were running an experiment they should be open and honest about that. There was no immediate response. Neither had I been given any response in writing, the chair simply noted that the restorative justice item was coming up later in the meeting, at item ten, and meeting simply moved on to the next agenda item. It was an hour or so before restorative justice was discussed. The chairman introduced the item, an update on the current force position in relation to restorative justice, noting it had been requested by members of the committee at their previous meeting. The written report to the committee was from the Chief Constable, but he was absent without apologies or explanation and the report was presented by Deputy Chief Constable, John Feavyour. Recognising young people make mistakes. This concerns me as for me a key tenet of policing ought be that all adults ought be equal under the law. I wouldn’t want to see a situation where younger people committing a crime get the opportunity to get away with saying sorry or doing some work for the victim whereas an older person would find themselves in court for the same offence. The committee was told that savings were a key thing driving the force’s expansion of restorative justice, but the savings were not really financial but in terms of operational hours saved. Mr Feavyour said that the force had been using restorative justice on a small scale, in ad-hoc ways, for a long period of time. What was new was the massive expansion in its use with a force-wide roll-out underway which would result in “essentially all” front-line staff being trained in its use. On the evidence behind the force’s move, Mr Feavyour said his view of the restorative justice research was that it appeared to show that getting offenders to meet their victims was a helpful process. Agreeing that Cambridgeshire’s approach had not been extensively tried elsewhere or shown to work, he said he hoped the force’s experience would inform future studies and contribute to understanding. Turning to the framework Mr Feavyour said it was an omission on behalf of the force not to have included the list of offences in the report to the committee. (The chair, Cllr Lucas, appeared to offer him the opportunity to slip it into the online published meeting papers in retrospect). Mr Feavyour went further and said not only should the list of offences be supplied to the committee; but that the force should, and would, meet all the requests I had made for more transparency in relation to the way it was practicing restorative justice. The list is not definitive, it doesn’t say what’s in and what’s out. So in other words it’s not limiting or capping when the force is going to use restorative justice and provides no solid safeguards or assurances at all. I was left very unimpressed by this woolly approach. Mr Feavyour repeated the force position, saying the list of offences did not set boundaries; and that the use of restorative justice for offences outside of the list was still possible, “under supervision”. Directly responding to an element of a question I had raised Mr Feavyour told the committee that officers proposing a restorative justice disposal would need to have it agreed by their Sergeant. The committee were told that the force had now done 550 restorative justice disposals; and that victim satisfaction was key and victims were very happy with what had been done so far. The committee was told of risks of using restorative justice, one being that embarking on it blocked off the possibility of using the “criminal justice route” in relation to that offence. He said that dealing with something straight away when offender, witnesses and victim were all present together was one thing, but that when the restorative justice “punishment/reparation” involved the offender promising to do something in the future that left open a risk of the victim not being happy if the promise wasn’t kept and the police being left unable to change tack and put the individual before the courts. (No explanation as to why this is the case was offered). The committee was told that in-order to increase the amount restorative justice was being used it would be necessary for the force to start using it in cases where all relevant parties were not present when the police turned up. This he said would involve the police arranging meetings between offenders and victims, and moving the emphasis from an instant one, on the street, within the hour, to one later in the process. (Clearly this will throw off the predicted savings in the report which are based on an assumption of each disposal taking an hour). A member of the committee asked about record keeping. Mr Feavyour said the force kept records on restorative justice disposals which were internal to Cambridgeshire. He said no offender could have two goes at restorative justice within the force area (but that as records were not shared between forces there was therefore a possibility of someone being offered more than one chance). Mr Feavyour also, in response to a question, confirmed that crimes were recorded as usual in restorative justice cases. 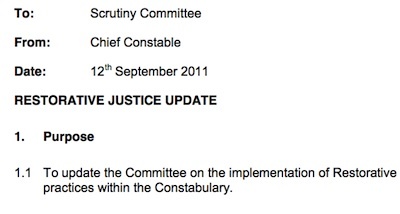 Unelected Police Authority member with responsibility for Cambridge, Ruth Joyce, who is now using her OBE in relation to her police authority work, asked for a report assessing the investment the force had made in the restorative justice training. She didn’t explain what she wanted but the Chief Executive of the authority indicated that it was something which had been agreed in advance and she knew what Ruth Joyce was proposing. Ruth Joyce asked about “partners” being involved in restorative justice and asked about “safer schools”. Ruth Joyce also asked if a restorative justice disposal would show up on an enhanced criminal records bureau check. The latter point was taken up by Mr Feavyour. He said that if a disposal was minor, and not recent, it would not be disclosed to the criminal records bureau. He said the force wold take a judgement in each individual case. Mr Feavyour said CRB checks were intended to get relevant information infront of decision makers but he knew that in practice the presence of something on a CRB check could be used by an employer or an admissions tutor or similar as a “blunt instrument” and as a reason to refuse a job or a course. Mr Feavyour said he felt the system was broken due to the fact those in receipt of CRB checks didn’t assess the information appropriately, so he and the force was going to fix it from the other side by omitting information they considered not relevant. Members of the committee asked to see more details of the force’s policy in this area and the committee came to a consensus view, summarised by the chair, that the Police Authority would like to see the “specification” for issuing CRB check documents in relation to restorative justice disposals. This was the closest I think I saw the committee to functioning effectively and doing the kind of thing I’d expect them to in the whole meeting. The chairman began to summarise the discussion on the whole item, saying a key thing was clearly openness and awareness of restorative justice. One member suggested taking presentations to the Community Safety Partnerships, another said that in two of her local neighbourhood panels presentations on restorative justice had been given and suggested that could happen elsewhere. The committee urged the force to pass more information to the public too; making clear that they wanted the framework published, including the details such as when the context of an offence would be considered appropriate for restorative justice and what types of punishments and reparations would be used. The committee also asked the force to consider evaluation of what they were doing, in addition to the specific piece of work requested focusing on the investment in restorative justice training. The police authority’s standing orders give those who use the public speaking slot the opportunity to meet with an officer of the authority to discuss the matter they have raised. Seek a response on my points commenting to the fact the police authority are scrutinising the force’s restorative justice practices after the event, rather than having considered and approved them before hand. And to see what can be done to prevent a recurrence of the lack of details in the presentations to both the full police authority and the committee so that the police authority members have the information they need to carry out their role. Follow up on the police’s commitment to comply meet all my requests for greater transparency, in relation to restorative justice practices, and ensure they fulfil it. This entry was tagged Courts, Police, Police Authority on September 13, 2011 by Richard Taylor. It is now out of date though (and was out of date at the time it was provided to the North Area Committee in July!). The core information it provides is a very limited set of offences deemed suitable for restorative justice, this list was expanded significantly beyond those listed in June 2011, and the latest position is any offence may be considered suitable for restorative justice. The response does contain some additional information which has not been published elsewhere, for example that a member of the constabulary staff is not eligible for restorative justice. Rather than saying an individual offender cannot be offered two restorative justice “chances” to avoid court by the force, it says an individual is eligible for restorative justice if they have not had a “low level disposal” within two years. “Trying to take people out of the court system and deal with them at a local level”. He gave an example of children damaging trees who would otherwise have been arrested been made to litter pick around the school in which the damage was caused. “There’s no limit on where it can be used, its just got to be proportional really”. When pushed to give an example he cited a case of shouting racial abuse. It wasn’t an example of a particularly serious case. I wonder if those committing the offences mentioned by the Inspector would really, as he suggested, ever have been arrested and taken into custody. Inspector Sissons also said that Inspectors and “gate keepers” – qualified Detective Sergeants can decide if it is appropriate to use restorative justice. You requested a meeting with an officer regarding the questions you have on restorative justice. Inspector Dominic Human leads this area of work for the Constabulary and he would be pleased to discuss restorative justice with you. He is not in the office this week, but if you contact him by email on dominic dot human at cambs.pnn.police.uk he will arrange to speak with you upon his return. If you have any outstanding queries or concerns following your meeting then please contact the Police Authority. I’m surprised by this, I would have expected to be offered the opportunity to meet a Police Authority officer to seek to follow/up and obtain a response to my comments. I don’t think authority members writing the procedures for public questions intended that someone raising a question at the authority would be given the opportunity to meet a police officer? Are restorative justice disposals being used where more than one offence has been committed (even in a series of different incidents)? Many of the problems being discussed in relation to police cautions, such as being issued to repeat offenders, and being handled behind closed doors, also apply to restorative justice disposals. For more of my comments on out of court sanctions used by the police see : Cambridgeshire Police Restorative Justice Update – September 2011. The professionals with access to those in power are at last catching up with at least becoming aware of the disparity between what restorative justice research is on, and what Cambridgeshire Police are calling restorative justice. Heather Strang of @Cambridge_Uni tells @dottymcl @BBCCambs that @CambsCops shouldn’t call “all" informal disposals “restorative justice"
Hopefully this will prompt research into the kind of thing which Cambridgeshire Police are doing – instant on street reparation (sometimes without reference to any “victim”).